The day after Thanksgiving my Christmas music was playing. The season had finally begun! Every season I start worrying how fast time is going. I only get to celebrate this season once a year! I must make the most of it. So far I'm doing good, but there is so much more to be done and we're already through the first week of December. 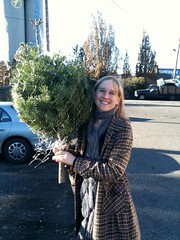 Last week Josh and I got our Christmas tree. It's so tiny and cute. Almost a Charlie Brown tree, but not quiet so barren. And by tiny, I mean we could both carry the tree. Easily. It's perfect for the apartment though. 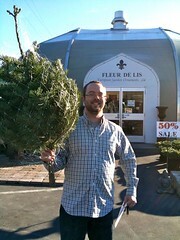 Josh had this great idea for decorating the tree - we added fresh baby breath flowers. Apparently his parents have done this for years (and looking back at pictures from last year - he's right, I see it on their tree!). Then I added poinsettias, which is something my family does with our tree. Together it's quite a beautiful, little tree. As I said at the start of the entry, the Christmas music has begun. Today I opted to add to my Christmas music collection. I need to keep it updated and fun. I bought the Glee Cast Christmas album (here's a song). That was inspired by the Glee show that aired this week. It was themed after the Grinch with Sue as the Grinch. HA! Then I bought Owl City's Peppermint Winter. (Did you know Owl City if from Seattle?). I took all these songs and burned a CD for my car. I added some Straight No Chaser songs too since they are my favorite. If you don't know them, listen to the 12 Days of Christmas song they have - it's awesome. 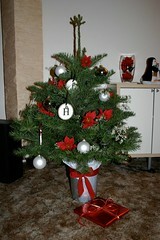 We've also decorated our little home. Their are Christmas lights over the door and a wreath. I put out the Christmas decorations too. I cut out some snowflakes and taped them up. It's looking very festive in here. There is still much to be done though. I need to watch more Christmas movies. I've only watched the Muppets Christmas Carol so far. So many to watch! I should just plop on the couch for a day and do a Christmas movie marathon. That'd be sweet. If only there were time to do so. Josh will be out of town for work, so perhaps I'll fill time with movie watching. Not to mention, I need to get into the kitchen for cookie baking. I do like to get a bit closer to Christmas though because the cookies are best fresh on Christmas. However, who says we can't just enjoy them all month? That's a self appointed rule I made up though. It's fun to have all the cookies on display on Christmas day. Just something special about it. I will make pepparkakor and biscotti soon though because they last a while. Plus pepparkakor takes a long time to put together. They're like sugar cookies. Rolling and cutting, and rolling and cutting, and baking and cooling. Repeat and repeat. Delicious though! 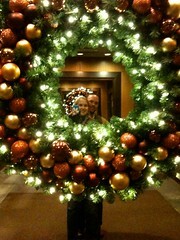 The season celebration is not limited to home either. Our store has decorated too. Starbucks is great at Christmas time. The drinks, the merchandise, the music - it's great. As a barista though, it's busy. 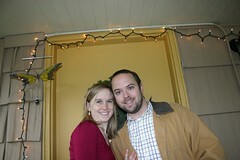 We've had parades, tree lightings, Santa across the street, and caroling contests all outside our front door. We've also made stockings with our names (using puff paint at our last store meeting) and hung them over our fireplace with care. Oh my, the season is here!